Wedding outfit - Do You Speak Gossip?Do You Speak Gossip? Unfortunately, the battery of my camera was dying and the only electricity company in Greece was on strike (so no power for hours), and I couldn’t charge it. As a result, I took my pictures in a hurry and once again they are of poor quality. The lighting didn’t help either, cause it was already afternoon when I took them, and it was cloudy and a bit windy. Terrible for outfit pictures! So once again, please excuse me. Dress: Lynne, bag: vintage, shoes: Aslanis, Sunglasses, Donna Karan, right earring (which doesn’t even show in the pictures): unknown brand, cuff bracelet: Dyrberg/Kern, Ring: YSL Arty Oval in Aqua. I was also wearing a nice linen pashmina for the wedding party, cause it was so cold outside but I forgot to wear it for the pics. It was a gift from a friend, bought in Italy. Maybe next time! I’m also wearing my new red nail polish by Seventeen no. 28. I’ll do a detailed post to show it to you. Last but not least, close-up photos of my heels. One of my favourite pairs! I loved their color from the moment I saw them, bought in one of my small trips from a fantastic store in Trikala. I wasn’t going to buy them, but I couldn’t resist so I hit the ATM as fast as I could. I love dressing up but my feet were killing me because of the ugly burn on them. I had to put make up cause it looked pretty bad. Luckily it worked. The wedding party was the weirdest I’ve ever been to. We stood there for 1 hour without power, so no lights, no music, no ovens etc. to prepare the food. Total failure! Everyone was so disappointed, that the facility where the party was being held had no power generator. Luckily the power was back and we continued with the festivities, and later on went for drinks with friends. So, what do you think of my formal-ish outfit? kouklitsa!! !mou aresan poli oi xromatikoi sou sindiasmoi k klassika latrepsa ta papoutsia!!! S’euxaristw poli Christinaki!Kai egw exw trela me ta papoutsia,einai megali mou adinamia! OK, don’t laugh, also not think “she’s lying”, because I’m not – but this is THE MOST BEAUTIFUL OUTFIT I have ever seen you wearing! Remember I always say it? But it’s so true! This dress is so amazing! The style, the color! The sandals too, but the dress is really amazing! I wish I had a dress like yours to go to the Crete wedding next month (that I still don’t know if I’m going!) Well, and if I go, I hope that they don’t have to stop the party for that long! Nice pictures, you look lovely! uperoxo forema kai papoutsiko super!!!!!! latremeno tirquoise!uperoxo forema!episis m aresei para pl t clutch s.
fantastic outfit for a wedding! Love the pink sash running through the dress! I am so in love with your ysl ring combined with these amazing shoes! I love your shoes, so beautiful. You look great in that dress. très jolie tenue, j’aime tout, la robe, les chaussures, les bijoux. Beautiful dress! Don’t you just love it when you know you have a special event coming up so you can wear all those more formal outfits? Hey M! So sorry for that.. i think i posted the comment by mistake.. i was really meant to comment in this outfit post of yours.. coz i really like the dress and the colorful accent that you added.. really pretty.. 🙂 i followed you again.. i think i got so confused. Hey Sol Sia. No problem, don’t worry. I figured that the comment was meant for this post, and I remembered that you were already a follower, and that’s why I commented back again. Thank you for your comment and for following me back…:) I really appreciate it! Pingback: Day 6 in Chios – Daskalopetra, Kardamila, Lagada | Do You Speak Gossip? 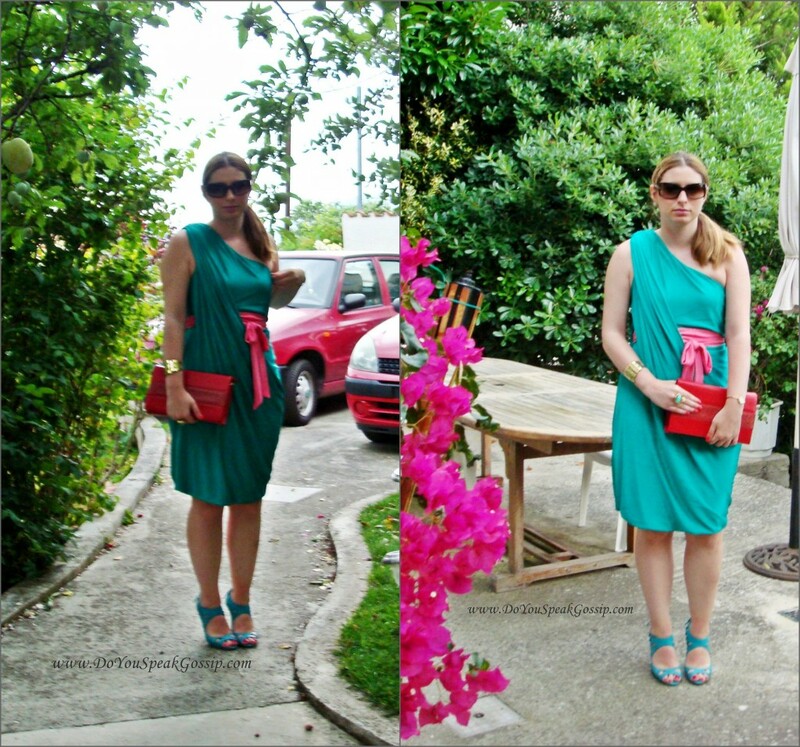 Pingback: What I wore to my nephew’s christening | Outfits | Do You Speak Gossip?